There comes a time when you need more storage space in your facility, and you have to come up with a solution. There are three standard options to increase facility space and improve logistics, but which is the most cost-effective and beneficial solution? Keep reading for warehouse storage ideas that will save you time and money. Mezzanines provide a long-term solution to warehouse storage. One of the first things facility owners consider are new buildings or add-ons. However, these are costly, time-consuming and inefficient solutions. Warehouse storage can almost always benefit from mezzanines to increase facility space. So how do mezzanines work? 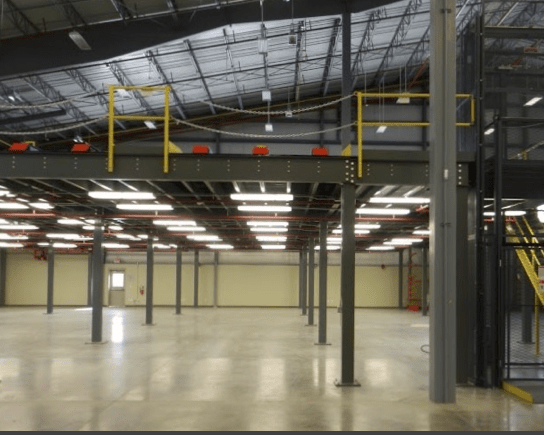 If you haven’t considered mezzanines to increase facility space, you should. Most warehouses have ample storage space that can be taken advantage of even when the floor is filled. How? Mezzanines utilize vertical storage space opportunities, providing a complete additional level of storage capacity. Not to mention, mezzanines are durable, versatile, and affordable. Before considering a new building or building additions, it only makes sense to use all available storage space first. When there is a solution which costs less, is lasting, and provides a long-term solution to a need for space, there’s no need to go through the arduous steps of acquiring new property. S.W. Betz installs and repairs mezzanines for your facility demands, and we carry the best, most trusted brand in warehouse storage solutions: Cogan. If you’re ready to increase your warehouse storage capacities, call us today for an affordable solution to your facility’s storage needs! If you would like to learn more about warehouse storage ideas or how you can increase facility space, please contact S.W. Betz by calling 410-574-1414 or 800-332-0322 today! You can count on the S.W. Betz Company to work with you and provide you with our extensive knowledge of the industry. This entry was posted on Tuesday, February 16th, 2016 at 4:00 pm. Both comments and pings are currently closed.